Hen Harrier Day 2018 is nearly here! Saturday 11 August will see the third Hen Harrier Day at Rainham Marshes - an event organized by Birders Against Wildlife Crime to mark Hen Harrier Day 2018. All money raised goes to Birders Against Wildlife Crime and they'll be giving an update about their raptor satellite tagging project too. Follow @HHDayLondon for more updates. Look forward to seeing you there! The nearest railway station to this reserve is Purfleet. Purfleet train station is on the C2C line from Fenchurch Street. The reserve is a 20 minute walk from the station following the brown pedestrian signs along the riverside path. Turn right out of the station and then join the path at the Royal Pub. Follow the River wall path and then cross the Mardyke Bridge to the Visitor Centre. By bus: the ensignbus 44 bus route which runs between Lakeside and Grays, stops near the reserve entrance on New Tank Hill Road. This bus runs every hour and up to 30 minutes during peak periods. We will be having a Dr Bike session during the day as well - so pop over and see our brilliant bicycle mechanic to give your bicycle a once over, fix any problems, or if you have any questions Jonathan will be willing to help! Thank you for your comment - and that you are coming along, it should be a good event. Apologies - yes I fully understand that public transport is not suitable for everyone, and I don't want people to do that if it's not right for them! 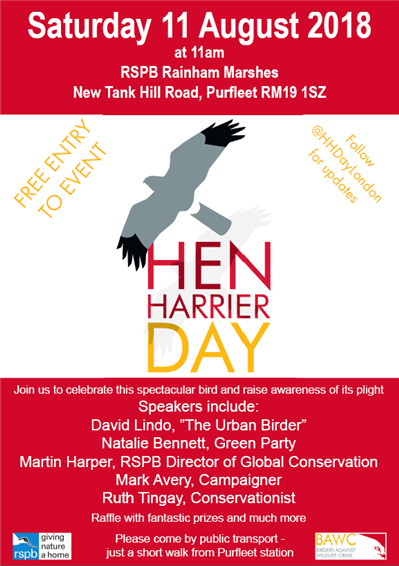 I do want to let people know we have limited parking spaces that can fill up quickly on Hen Harrier Day. Thank you for the feedback and I take your comments on board. I'll be coming, but I really wish you'd give it a rest with the public transport. A return train journey from Felixstowe to Purfleet and back would cost nearly £51 and it would take almost three hours each way! Ludicrous, when you consider that I live an hour and twenty minutes' drive from Rainham Marshes itself. I appreciate that anyone coming from London will do well to catch the train but that won't apply to everyone.